In my ruminations on the male characters in Pride & Prejudice, I first decided I might discuss them from the least important (in my eyes) to the most important, Mr. Darcy, of course. 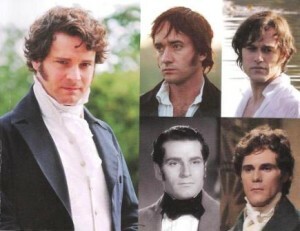 Or perhaps, I would discuss them from Mr. Darcy to each lesser character. A third option might compare the men from Lizzy’s sphere with the men associated with…Mr. Darcy. Do you begin to see my dilemma? Jane Austen wrote a book about Elizabeth Bennet and Mr. Darcy and amazingly ties each male character to the leading man in an intricate way while creating, at the same time, very individualized, stand-alone men in their own right. So it seems I must discuss each character’s wonderful foibles and personalities (in no particular order) and how they re-make Mr. Darcy into who he becomes, the hero in one of the greatest love stories ever written (opinion mine). Let us first examine Mr. Bennet. Considered a gentleman, he allows his children, especially Elizabeth, to be who they want to be not who they should be. Lizzy, with her love of books and wonderful sense of the ridiculous, becomes his obvious favorite as the one most like him. And he plays a significant part in Darcy’s preference for Elizabeth. In describing the really “accomplished” women of the day, Darcy adds, “…and to all this she must yet add something more substantial, in the improvement of her mind by extensive reading.” Darcy is already interested in that quality in Elizabeth, one fostered by Mr. Bennett. She and her father also have their share of fun at Mr. Darcy’s expense until Mr. Bennett discovers what he believed about Darcy to be untrue. Darcy’s intervention in the case of Lydia and Wickham was the eye-opener and he was finally pleased to say to Elizabeth, “I could not have parted with you, my Lizzy, to any one less worthy.” Mr. Darcy began the process of putting himself out for others out of his love for Elizabeth. Next is the sweet, loveable Mr. Bingley. I wished to start out with him because he establishes the connection with the Bennetts that allow us to be introduced to Mr. Darcy’s harsher side. We cannot learn of it any other way because the evil of Mr. Wickham cannot begin this early in the story. He becomes forced to rethink his actions and in the end must apologize to his adoring friend. The character development of Mr. Darcy through Mr. Bingley is wonderful, compliments of Jane Austen! Shall we move on to Mr. Collins? Who but Ms. Austen could create such a character? He is a buffoon, a name dropper, a sniveling little man (no matter which actor of choice portrayed him) with a self-righteous piety that lasts only until his benefactress is conjured up by himself or another. We start out believing Jane created him solely for our enjoy enjoyment, comic relief if you will. But his connection to Darcy is ingeniously interwoven through Lizzy’s best friend, married to Mr. Collins, at Rosings where Darcy has easy access. Elizabeth needed the connection of Mr. Collins at Rosings to allow us to see Darcy in a different light. Well done, Jane! Ah! The infamous Mr. Wickham… When he appears, we are pulled into his ruse and we can now abhor Mr. Darcy as Elizabeth does. And Ms. Austen adds the twist that Lizzy may have found her match and we sit on the edge of our seats to see. But Wickham is nothing without his connection to Mr. Darcy. We had to see Darcy’s egotism and snobbery before we could believe the terrible accusations. And it is Wickham’s character development into total degradation with Lydia that allows us to begin to see Darcy in a new light. New characteristics he declares are only for Elizabeth’s sake, but allow us to begin a love affair with him after chapters and chapters of disliking him heartily. I’ll declare that Jane Austen never got a note from her editor that her manuscript needed more conflict! She is the queen of conflict in P & P.
We shall end with our hero, Mr. Darcy. I sometimes think technology has ruined literature more than enhanced it. I have opinions on each of the actors who have portrayed this hero but I must be sure to base my thoughts on Jane Austen’s Mr. Darcy and not an actor. So when I sit down with the book, all faces disappear and I read and re-read the story always culminating with the picture perfect hero (my own imagination inspires the way he looks) in an amazing love story. The changes that occur through the pages are all linked to the other male characters enough that we see Mr. Darcy become a new man, not only for the love of Elizabeth, but because he has seen his own shortcomings through the men with whom he interacts. I look forward to hearing other readers’ perspectives on their favorite characters. I fancy there are as many opinions out there as there are readers! This week we’re giving away a lovely copy of Pride and Prejudice. The book is hard cover with a ribbon book mark. The pages are rough cut to simulate the cut edges an original print would have had after binding. All comments on this week’s posts will be entered in the drawing. Must have a United States mailing address in order to win. Winner will be announced August 19, 2013. Previous PostPrevious Our Favorite P and P People and a Chance to Win!